Our goal is to connect our nation's Veterans with rescue animals. Pets for Vets helps create second chances and new beginnings. With over 300 successful matches, we are changing lives, one lick at a time! Pets for Vets NYC-Long Island, Inc. is a 501(c)(3) non-profit organization that rescues and professionally trains shelter dogs to provide companionship and emotional support for military Veterans with PTSD. We are 100% volunteer-run, and we are always looking for volunteers and fosters to help in Brooklyn/NYC and on Long Island, NY. 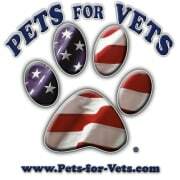 Please get in touch to join our "Volunteer Crew" and help both Veterans and shelter pets today! Would you recommend Pets for Vets NYC-Long Island?